Gift Card 500€. If you can't decide a gift among our wonderful products or if you want to give the freedom to choose, Binnichì Gift Card is a perfect gift idea! Gift Card 100€. 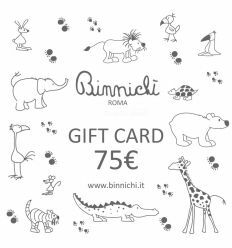 If you can't decide a gift among our wonderful products or if you want to give the freedom to choose, Binnichì Gift Card is a perfect gift idea!